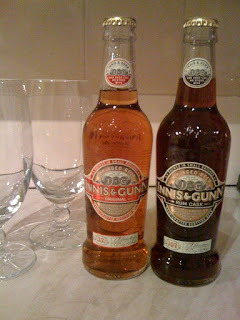 I'm a big fan of Innis and Gunn Oak Aged Beer. There's nothing subtle about it, but it's delicious. Big, huge, buttery-toffeness meets vanilla sweetness and then a woody finish. Fantastic. You can call it one-dimensional, over the top, samey, maybe too sweet. Whatever, I'm a fan and I'd happily drink it everyday. I also think it's brilliant for introducing lager drinkers to the wider world of beer. It's not hugely hoppy or bitter, it won't turn people off with a low ABV and it doesn't have an image or reputation attached to it that will deter the people who care about that sort of thing. It's smooth, it's sweet, it's really easy to drink, and most importantly, it's a bit different. Let them try it, enjoy it and then go into the fact that it's aged in oak, that this lends a woody-vanilla character, most beer isn't aged in oak, and so on. Before you know it, you've got another beer geek on your hands! I've just had a limited edition version that was aged in navy rum casks. I've always thought that rum and beer is a combination that could be exploited to yield some special results, I've even attempted a few things on my homebrew kit. The beer started life in plain oak and then after thirty days was racked into casks which previously held navy rum. After a further thirty days the beer was blended and finished for forty seven days before being bottled. I was a bit underwhelmed. I was expecting in-your-face rum, over-the-top and big; in the way that the standard Innis and Gunn is. Unfortunately not. The beer had the same sort of bitterness level you get from the standard version, the vanilla and toffee notes were still there but the big rum hit had been severely tamed by the wood. A meaty, smokey, rum-like dry finish powers through but you're ultimately left wanting. You're promised bug rummy, boozy notes, but you just don't really get them. Whilst I would recommend the Innis and Gunn beers to anyone, the hunt for a truly great rum enhanced beer goes on.